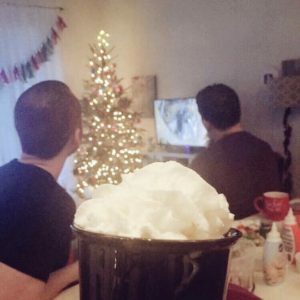 The holiday season is upon us! If you’re anything like me, you want your whole house to scream, “Christmas is here!”, but you only have the budget for your home to whisper “Christmas?” If you’re focused on decorating for Christmas on a budget, I’ve got you covered with some tips + DIY Christmas decorations to fill your home with holiday cheer. Get creative! Ornaments sets are relatively cheap. Buy a couple and hand them around your house, put them in vases, go ornament crazy. This is a project my mom is currently working on using ornaments, an old wire hanger and branches from an evergreen tree (you can ask for scraps at any Lowe’s or Home Depot, usually free!). Buy cheap! Target, Walmart, wherever you shop, is sure to have some great deals on Christmas items. Use items in unconventional ways. Use a Christmas t-shirt or sweater as your tree skirt. Most stores sell Christmas lights for only a few dollars per box of 100. A hundred Christmas lights can go a long way in decorating. Don’t forget the tree! You can buy small (3-foot) Christmas trees at Home Depot for less than $20. 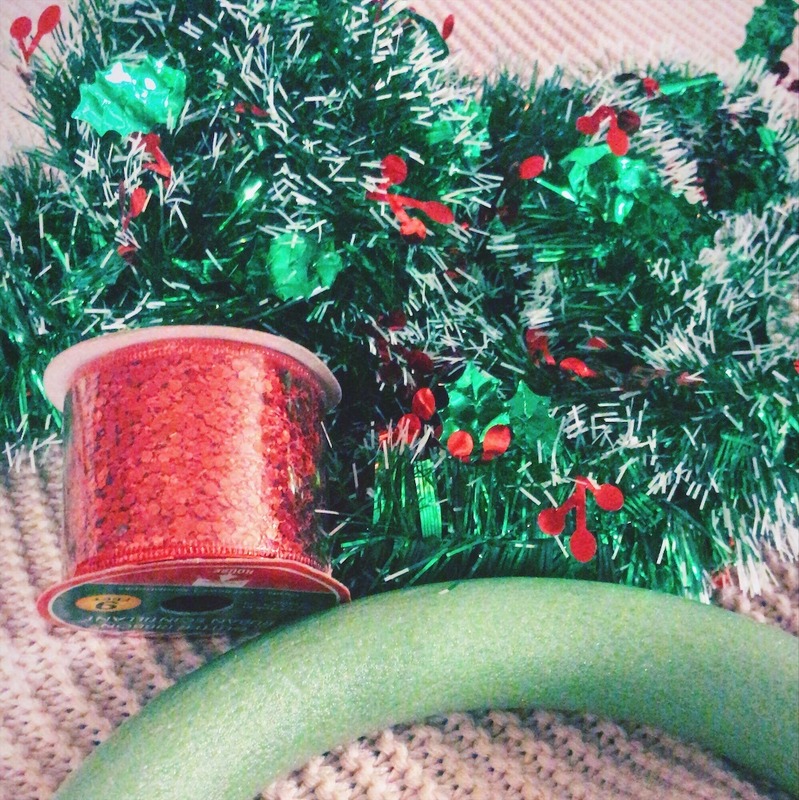 Buy a tube of ornaments and some tinsel and you’re in business. If you go to a Christmas tree lot, you can usually find small or ugly trees for great prices. Or they may even be getting throw away. Ask people who work there what kind of deal you can get on your Charlie Brown Tree. While living in Austin, I went the decorating for Christmas on a budget route. I went through my grandparents’ attics to get their excess ornaments + other holiday items. Then, I got myself a damaged (but beautiful) tree + a few boxes of lights. I wanted to add a little more color to my apartment – without breaking the back. I stumbled across the idea of tissue paper tassels + created garland to cover every doorway, table, and countertop. 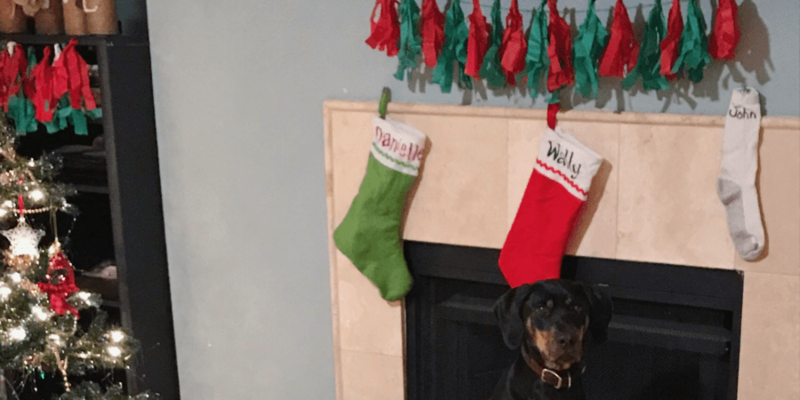 This garland is simple to make + you can buy all the pieces you need at the Dollar Tree! What you need: tissue paper (one sheet per two inches of garland you want), string, hot glue gun + glue, scissors. Fold tissue paper lengthwise, widthwise, then lengthwise again. Cut non-folded side into trips about 1/2″ thick. Unfold + cut down the middle. Open halves, roll them, then twist in the center. Twist into loop + glue at the base before sliding it onto the string. Personally, I like to space my tassels out about an inch on the string so it is nice + full. I also like to add some color variety so I try to find paper with more than one color + pattern. Earlier in the post, you saw my tassel garland out in the wild! Another great Dollar Tree find is to DIY your own wreath. For that, choose two sections of garland. I choose the shiny green with holly in it. You’ll also want to go to the floral section and get one of the green, styrofoam floral rings. To make your wreath, you just need to wrap the garland around the ring. You may want to double up for a thicker. 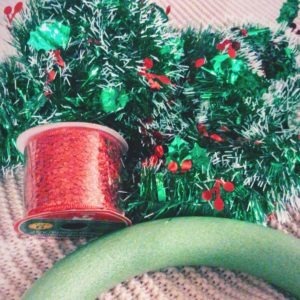 I also bought a glittery red ribbon to make a bow. I can use the excess to create more bows to add more holiday cheer. Hopefully, these tips + DIYs have inspired you to add some holiday cheer to your home! You don’t have to break the bank to deck the halls. If you have any tips for decorating for Christmas on a budget share them below or over on Instagram! Check out my other posts for Christmas hacks like these easy, yet adorable holiday cookies!